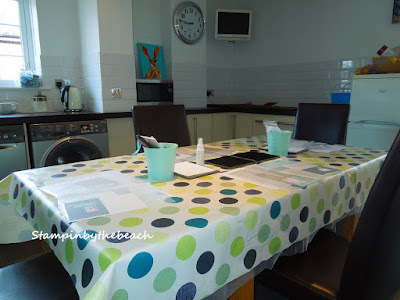 I have had a couple of weeks off from card challenges as I have been preparing for my first card class. I had a quick look this morning at Freshly Made Sketches and had an idea pop into my head! I have been obsessed lately ,with die cutting then inserting the same die cut in a different colour. Of course there will be a name for this technique but it has slipped my mind. I was brave and used black card stock which is a bit of a leap for me. 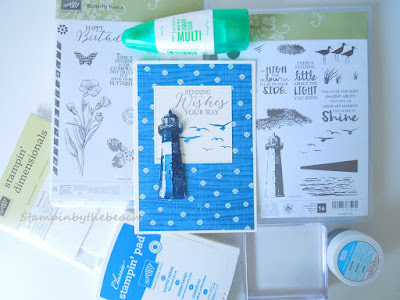 I've used a few different Stampin Up sets for this card, I will list below. 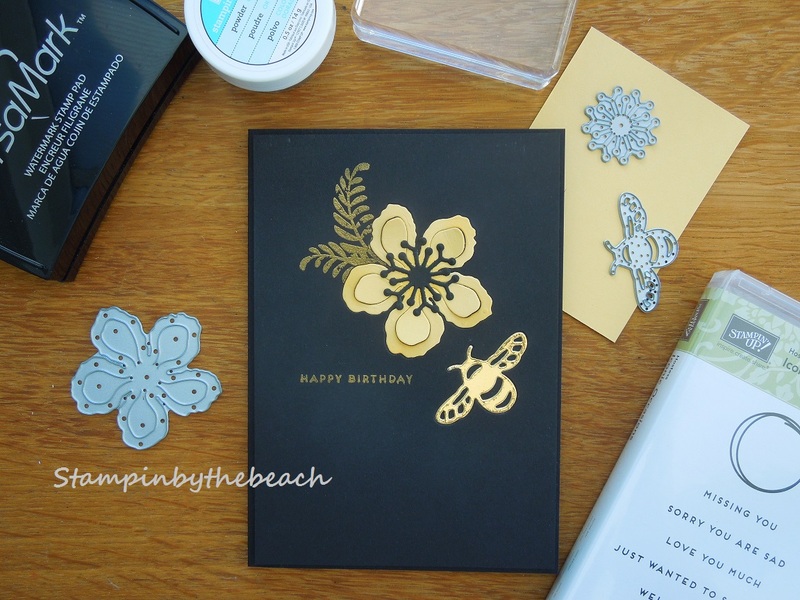 After the initial die cutting of flower and bee I stuck the original flower back into the card and stamped the leaves with Versamark ink so I could gold emboss, I stamped the sentiment at the same time. Then I stuck a scrap piece of black behind the die cut holes then glued the gold and Soft Saffron die cuts into the card. I've backed the layer with black fun foam and then stuck to a black card base. Inside I've used Soft Saffron card stock to write on. Black and So Saffron card stock. 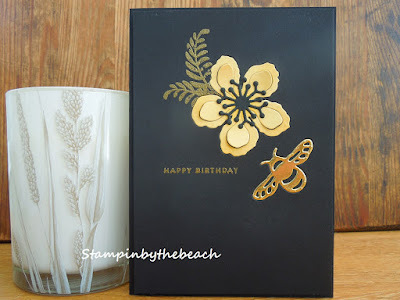 Versamark ink and Stampin Up gold embossing powder. Botanical Builder and Detailed Dragonfly dies. 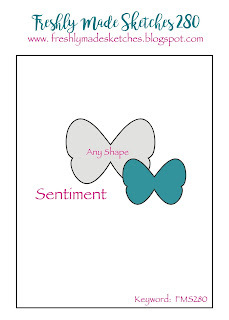 Iconic Occasions stamp set for sentiment. Awesomely Artistic Stamp set for leaves. Today was my first card class. We had great fun making three cards. My ladies are quite new to card making so I wanted the cards to be easy to make but also good to look at. We also had a go at heat embossing in gold. If your interested in joining a friendly casual card making class near Colchester Essex, please contact me and I can give you further details. 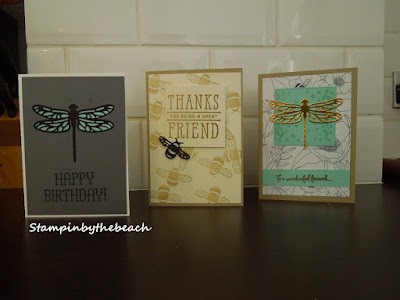 I featured the Dragonfly Dreams stamp set in this class, ladies made a great job.of these. This is my favourite stamp set at present. I just love the lighthouse. I needed to make a card for my big brothers birthday and he loves fishing, boats the sea, so perfect. I used By the shore DSP 146040 and as this paper has very vanilla in it I made a very vanilla base 106550. I also cut the largest square from the stitched shapes dies in very vanilla. 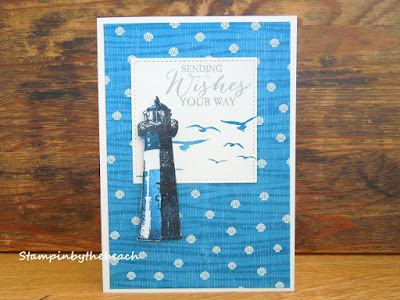 Obviously the lighthouse was from the High Tide stamp set 143006 and I stamped using black 140931 and Dapper Denim 141394, the sea gulls were added with Dapper Demin after I heat embossed the sentiment with the silver embossing powder 109131. I wish there was a Happy Birthday sentiment with High Tide stamp set, but theres not, so I used this sentiment from Butterfly Basics 138816. You cannot see in this photo but I covered the whole lighthouse in clear embossing powder to give it a shine. 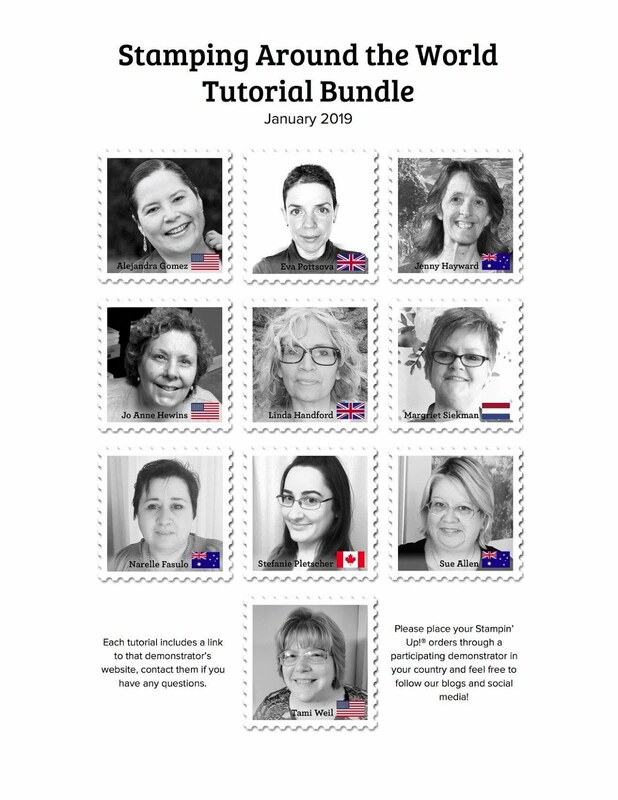 I have included some product codes above, stamp set codes are for photopolymer stamps.